British photographer Tim Richmond first experienced the American West at a rodeo, in Sheridan, Wyoming. “Straight away, I was hooked,” he says. That was in 2007. He returned many times over the next four years, stopping to take pictures in places like Casper, Wyoming and Jericho Road, Utah. “Following hunches, the project evolved naturally,” he says. Those hunches, and years on the road, produced "Last Best Hiding Place," a photography collection that honors Richmond’s West. Jennifer Kirby: The American West has been the subject of much documentary photography. What drew you to it, and how did you seek to distinguish your photographs from what others have captured? It felt to me that it was a place where people and places can disappear. My influences are more rooted in cinema than from any specific photographer’s work. Distinguishing my photographs from what had preceded them is a consequence of 30 years [of] distillation of ideas. It is important to acknowledge other photographers’ work in the West, such as Avedon’s In the American West, or Joel Sternfeld’s travels, Robert Adams … But they are exactly that, an individual photographer’s West and nobody else’s. The real West is what you decide to make of it. JK: You named your collection the ‘Last Best Hiding Place,’ yet people often associate the West with vastness and openness—the opposite of a good hiding spot. What did you see in your subjects and in your collection that prompted you to select that title? JK: Many of your compositions use light—reflections in store or shop windows, for example—which, for me, highlighted that sense of being hidden. What techniques do you use to capture those fleeting moments? TR: I have long been interested in windows and reflections, as have many others from Hopper to Friedlander, due to the barrier they erect between the camera and subject, creating a tension. Technically it is a matter of understanding the light, the dynamic range of the subject, and being able to get every last bit of tonality out of the negative. JK: How do you navigate the photographer-subject relationship? How close do you get—if at all—to the people and places you visit? TR: I wander around, circling the place, letting it sink in, sometimes realizing that I have to return when the light is different; whereas [with] people I will often approach and ask to photograph, realizing that the moment with them is most likely only in that moment. Mostly I move on with only a few tales from the people and places that I photograph. JK: One thing that struck me about the collection was an undertone of sadness—as well as vulnerability—in many of your subjects. Did you set out to capture this, or did it surprise you to find this in your photographs? TR: I do not set out to reveal a certain sadness or vulnerability, but rather encourage people to find an internal place. I very rarely encourage anyone to look at the lens, since I feel that mostly delivers a one-dimensional viewpoint. I prefer the viewer[s] to create their own stories from the moment depicted. Places can also seem alone, like people, filled with melancholy. JK: Many of your photos contain religious subject matter. How did you see faith fitting into the idea of a ‘hiding place’? TR: I came across a church in South Dakota that was two hours down a dirt road, with nothing remotely near in it in any direction, a religious island amongst a million acres. How far did people have to travel to attend to their faith, or was it a relic from years past, replaced by TV evangelism? It struck me how powerful the faith was of many of the bull riders that I travelled with, but then again if you stand two feet away from the chutes where a 20-year-old is astride a 2,000-pound bull with a tight strap around its groin, I guess it all makes sense to believe in a benevolent force. JK: Your photo, “Santaquin, Utah” (above) resembles the composition of Garry Winogrand’s “New Mexico, 1957.” Did you have his work in mind when you took your photo? TR: No, although I am very familiar with that image, and I can see why you see the comparison. But actually I was so curious with whole new towns being created a few hours outside Salt Lake during a real downturn in the housing market, and this house was awaiting the ready made lawn to be laid. 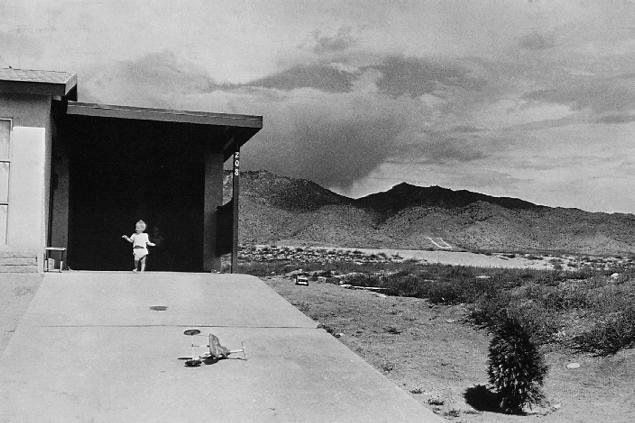 I guess that Winogrand was travelling around New Mexico also seeing towns rise up in the desert in 1957! JK: Describe a moment, or a person you met, or a scene you stumbled upon, that you feel best captures the theme of this project. TR: I came across a biker in Sturgis, South Dakota prior to the colossal annual gathering of Harley Davidsons, who was looking for work, and his story was that he lived with a woman years ago, it went bad and he spent the ensuing 25 years on the road with his trusted Honda Goldwing and a tarpaulin, moving from biking events to harvesting marijuana. His story was one of someone living “off” the radar. JK: What do you want viewers to take away from this collection? TR: As with all my photographs, I would hope that the viewer create their own stories from the images. What people find is what they are looking for.